« Can we learn without learning institutions? This post is a reflection on Paul Smeyers' article titled, "What philosophy can and cannot do for education." "debate ... does not lead to conclusions; rather, its function is to make those involved sensitive to the way something can be appreciated"
Once the author explores Wittgenstein's propositions linking language with meaning, he eventually describes the importance of literature as artistic applications of language in order to explore and share understandings of the human condition. Wittgenstein's proposition 7 famously said, "Whereof one cannot speak, thereof one must be silent." Smeyers connects this with the notion that there are aspects to the human condition and experience that are beyond words - that language has no capacity to communicate effectively about matters of the soul, or deep emotion. These, Smeyers seems to suggest, are the domain of art rather than literature. We experience art and feel our way to understanding through "perspicuous representation" which, I believe, can also be made with language though Wittgenstein might point out the vast distance between the word and the meaning. Therapy is an intervention intended to fix a problem. The means by which the problems are fixed is Philosophy. The tools of philosophy are myriad - different conceptual frameworks within which related tools are used to deconstruct, analyze, and understand the issue working toward a solution. As educators equipped with these tools, we can better deconstruct messages, find meaning in texts, recognize the lenses through which our students see the world, and improve our facility with communication to engage with and share thoughts and experiences with others. Have to admit that this article was a hard slog. I dabbled in linguistics for my undergrad and read a little philosophy here and there, but I needed a lot of support to get through this article. 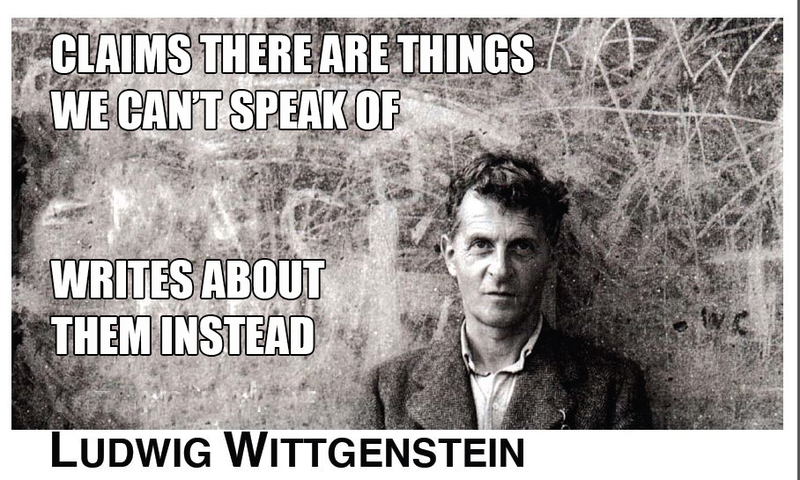 Ended up reaching out on Facebook to some friends in the thinking business.They filled in some blanks and connected me with a couple of explanatory papers on Wittgenstein's propositions. I'm sure there is a lot I missed from the article though I certainly know a lot more now than I did before! Anxious to hear other's reflections and reactions to the article! Thanks to Michael Mauws, Phil Veldhuis, and Luke O'Connor for sharing their insight and understanding of Wittgenstein's role and message. Wittgenstein: "Whereof one cannot speak, thereof one must be silent."